Three-time champions Mumbai Indians will kick start their campaign for IPL 2019 against Delhi Capitals. The Wankhede Stadium, Mumbai will host the 3rd game of the league on March 24. 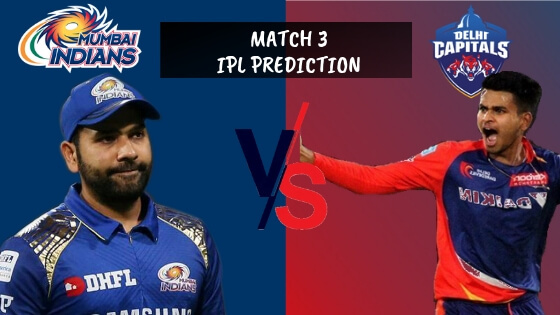 Keep reading to find out the IPL 2019 MI vs DC Match 3 Prediction. Mumbai Indians had retained the core before the auction this year. The fans will get to see the familiar faces with the likes Rohit Sharma, Jasprit Bumrah, Pandya Brothers, Kieron Pollard donning the Mumbai colors once more. However, the side hasn’t been known for starting the seasons pretty well. This year, they would dearly want to correct that. On the other hand, the Delhi-based franchise will appear in an all-new avatar. Their name has changed from Delhi Daredevils to Delhi Capitals. Also, the color of the jersey has taken a different shade of blue as opposed to last year. But more than anything, one thing they would hope to change is the fortune in the league. IPL 2019 MI vs DC Match 3 Prediction: The last time these two teams had met, DC won and the loss put MI out of contention for a playoff spot. They would look to avenge that loss. Also, when MI plays at the Wankhede, it has always been their fortress which is difficult to breach.